Allocation of funds to States? 1934 Visvesvaraya plan in this book “The planned economy of India”. He was an Engineer, Ex-Diwan of Mysore and Bharat Ratna recipient. 1938 Nehru’s Congress plan. But not implemented due to WW2. 1944 Bombay plan by noted industrialists such as JRD Tata, GD Birla, Kasturbhai Lalbhai et al. 1944 Sriman Narayan Agrawal’s Gandhian plan. 1945 MN Roy’s “people’s plan” – with socialist leanings. 1950,March 15 Cabinet resolution to form Planning commission. 1952,Aug. National Development council (NDC) made by Cabinet resolution. 2014,Aug. Modi shuts down planning commission. 2015, Jan Government notified the formation of Niti Aayog- National Institution for Transforming India. Main focus: Agriculture, irrigation and power. Got more GDP growth than its original target. Socialist model, Rapid industrialization, heavy industries. Holiday declared thanks to #EPICFAIL of 3rd FYP. #EPICFAIL due to Bangladeshi refugee problem and drought. Morarji Desai’s Janta government came up with Rolling plan system – we’ll measure progress every year and make new plans accordingly for next year. Focus on employment. Jawahar Rozgar Yojana started. Political instability at Centre. Hence only annual plans. Growth with social justice and equity. Mostly “indicative” planning. #EPICFAIL due to global slowdown after Asian financial crisis. 8% GDP growth rate, double per capita income in 10 years. C.Rangarajan framed it with targets: 8-10% growth rate, 70 million new jobs, lower IMR, CMR, TFR etc. Theme: “Faster, More inclusive and sustainable growth”. Target growth rates: 9% GDP, 4% Agriculture, 10% Mfg. 10% reduction in poverty, create 50 million new jobs. Increase mean school years, forest cover, infrastructure investment, rural tele-density. Achieved >9% GDP growth-rate during 2005-07, thanks to American boom prior to sub-prime crisis. But almost all nations of world experienced high growth. So 9% GDP did not come from Montek’s magic wand. Post sub-prime crisis, failed to evoke the “animal spirit” in Indian economy. GDP-fell, inflation rose during 2008-13 nonstop. Reduced poverty by doctoring the BPL-line. Tendulkar line says 27 crore BPL, if we use Ranga line then 37 crore BPL. Planning commission brags reducing poverty line on Tendulkar’s parameters. Hopes that CAG and Public accounts Committee will take care accountability part. But PAC too is pretty much toothless. Failed to implement land reforms. Faulty policies for MSME, industrialization, Factory-labour law problems. Designed CSS with One size fits all approach and a few extra crores to NE/J&K/Hill-states and LWE. But for long, it did not use pilot projects / sample testing / interaction with states. They tried to bypass state Governments via NGO-funding, DRDA. Hence States unenthusiastic about implementing Central-schemes named after you know who. Only in 2013- reforms done like reducing number of Centrally sponsored schemes (CSS), 10% flexifund to states, direct transfer of money to state consolidated fun etc. But it’s too little too late. Shortcomings in planning commission => new bodies sprung up like PM’s economic advisory council, PM’s project monitoring group and so on=> more brains=> more lack of coordination. Hence Modi felt that PC is beyond fixing- just like Gotham city and Delhi city. For so many years, Government worked as the “provider of first and last resort”. But, today Indian industry and service sector has reached on global scale, a neo-middle class has emerged. Times have changed, from being a underdeveloped country in 1950s – India has become a major economic force. Hence our needs have changed- from mere food security to profitable agriculture. In this playground, Government needs to become an “enabler” rather than a “player”. And thus Niti Aayog was born. died in 2014, August after Modi became PM. Vice Chairman Last Dy.Chairman was Montek Singh Ahluwalia (Cabinet minister rank). Free market economist Arvind Panagriya. He was the Chief economist of Asian Development bank, and the the brain behind Rajasthan’s land-labour reform. A secretary level bureaucrat with fixed tenure. Same Ms. Sindhushree Khullar is the first CEO. Full time members 4-7 full time members, who enjoy “Minister of State” rank. +PM can invite other experts as and when needed. 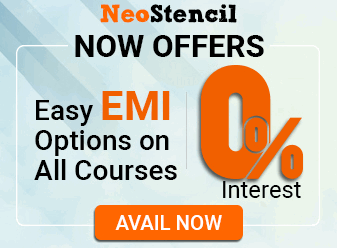 part-time members Tech experts from research institutes. Currently none declared. Rotational posts. Lieutenant governors of all Union territories. ad hoc Regional Councils Will have CMs of states that fall in the region. They’ll be dealing with specific issue concerning a group of states for example irrigation, naxal-problem, infrastructure etc. Think tank for Government policy formulation. Find best practices from other countries, partner with other desi-videsi bodies to help their adoption in India. Cooperative Federalism: Involve state governments and even villages in planning process. Sustainable development: + Modi’s Zero defect-zero effect (on environment) manufacturing mantra. Urban Development: to ensure cities can remain habitable and provide economic venues to everyone. Participatory Development: with help of private sector and citizens. Focus on 5 crore Small enterprises– to generate more employment for weaker sections. Monitoring and feedback. Midway course correction, if needed. Make policies to reap demographic dividend and social capital. Regional Councils will address specific “issues” for a group of states. Example: Regional Council for drought, Left-wing extremism, Tribal welfare and so on. Extract maximum benefit from NRI’s geo-economic and Geo-political strength for India’s Development. Use Social media and ICT tools to ensure transparency, accountability and good governance. Lot of bol-bachachan giri and vague ideas about national self-interest, capacity-building, participating in ‘global-village’ etc. Design FYP-Five year plans Design national agenda, and cooperative federalism. How much money to give for each state’s own state-five-year-plans. Mostly work as a “policy-formulation-hub”. The Press release is ‘silent’ on money/funding. so, most probably it’ll be left to finance ministry. Some experts believe Inter-state council will decide money allocation to states, then finance ministry will release the fund. States/UT were represented in National Development Council. PC framed FYP=>went to Cabinet=>NDC approved FYP=>Tabled in parliament. States/UT represented in Governing council. But no specific mention about whether they can approve/reject/amend Niti Aayog’s proposals? One size fits all, top-down socialist planning by Armchair Nehruvian economists and IES cadre officers (Indian Economic Service). Press release talks about participatory planning but how exactly will they do that? No specific details laid out. IES officers are rarely invited in Modi’s meetings. But given the entry of Free market economists and Technocrats, most probably it’ll be an ‘indicative planning + core planning’ i.e. after inputs of state governments, a broad outline with selected targets, limited subsidies and monitoring through ICT. Bibek Debroy (Fulltime member) himself criticized the vaguely worded press-release on Niti-Aayog formation. Modi should have specifically pointed out its functions and jurisdiction. Modi’s “arbitrary decision” to dismantle the Planning Commission, without taking NDC or states into confidence- this undermines cooperative federalism. (Says Kerala CM). From union territory only Lieutenant Governors invited. CM of Delhi and Puducherry can’t participate in Governing council. Like PC, NITI Aayog too is a non-Constitutional, non-statutory body formed by a cabinet resolution. It is not accountable to parliament, and if line-ministries fail to achieve targets, NITI Aayog cannot punish them. Niti Aayog should have been created through a legal/Constitutional amendment. There should be a perspective plan spanning for 15 to 20 years. Otherwise, what if another party comes into power and dismantles this? Recall Morarji vs Indira. It’ll take minimum 6-8 months for Niti Aayog to set things in motion. In between that time, Development will be halted due to paucity of funds and ideas. Planning commission and NDC decided “special category states” and gave them additional funding to help the poor and backward regions. With advent of Niti Aayog, will those states lose their ‘status’ and extra-funding? Uncertainty prevails. Niti Aayog will conflict with Cabinet Secretariat (for inter-ministerial coordination) and constitutional body Inter State Council (for coordination with states). FinMin officials always try to squeeze budget to keep the fiscal deficit under FRBM targets. Niti Aayog and its free market economists will further reduce welfare schemes to help them. At present we’ve 60+ centrally sponsored schemes. Modi aims to combine them into just 10 schemes. Thus, poor and marginalized communities will suffer. Planning commission used to monitor of human development in the States, Sub-plans for women, SC and ST. Niti Aayog doesn’t say how they’ll do it. Modi distributed the planning-Expenditure function to FinMin and subject matters to respective ministries. This will result in loss of perspective and long-term view. Now State governments will have to lobby at both type of ministries to get funds released. 1961: Indian Economic Service (IES) was born on Nehru’s initiative. Modi doesn’t invite them in meetings, free market economists look down upon them with utter disdain. How they’ll be integrated in the new system? No clear answers given in the press-release. There is no need for any Planning commission or Niti Aayog. Good work can be done even without them- through line ministries and inter-state councils. Anyways, the real work of NITI Aayog is yet to begin. So, most criticism is centred around the theme that “Since press release doesn’t talk about xyz thing- so only bad thing will happen.”. But, only time will tell how NITI Aayog fares in real life. Gave share from Union revenue to states. Decides the formula for every 5 years. ~2% of GDP flew this way. Centrally sponsored schemes (~66 schemes). Money given after consultation between PC and respective ministries of health, education etc. at union and state level. Central assistance for state plans. Money given after consultation between PC, FM and State Government. ~2.5% of GDP flew this way. After scrapping the planning commission, Modi wanted the Finance commission to overesee all three types of “money-allocations” i.e. Union’s assistance to state’s plans. Constitution amendment necessary, to give finance commission these new powers. Finance commission is a non-permanent body constituted every 5th year, hence it can look at the issues from a fresh perspective. If its turned into a permanent body- then incrementalist approach will creep in i.e. throwing more money in existing schemes rather than fixing from scratch. 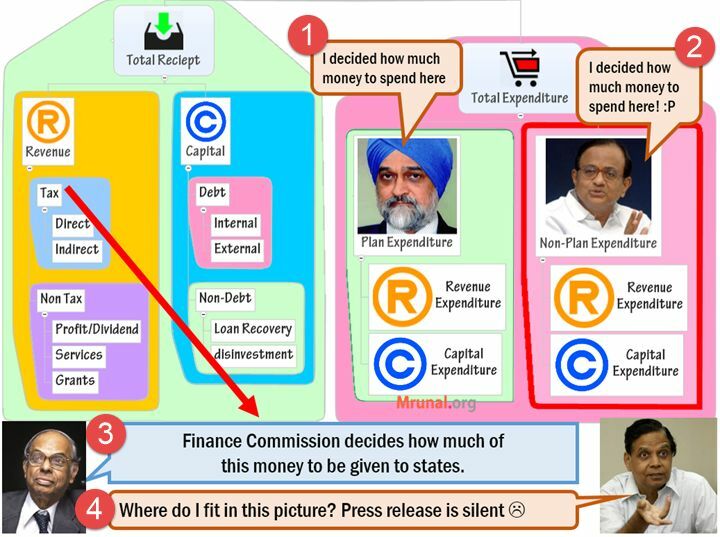 Finance commission members are expert in revenue-sharing. But planning Expenditure requires expert members with development, capital-asset building perspective. Gujarat CM even said, Union itself should give the plan-money to states, instead of keeping such ‘backdoor’ mechanism. Finance ministry makes fiscal policy. Makes Energy & oil policy Oil ministry, DG Hydrocarbon decide it. Real-Boss: State council headed by President of China. Cabinet Headed by PM. Experts thought Modi wanted to replace PC with a body like China’s NDRC. (National Development and reform commission). But Niti Aayog press release and jurisdiction is so vague, it’s nowhere near Chinese NDRC. Read background theory in Indian Polity by M.Laxmikanth (4th Ed.) Chapter 15, 41, 48, 49. Q2. MN Roy was associated with _____. Q7. 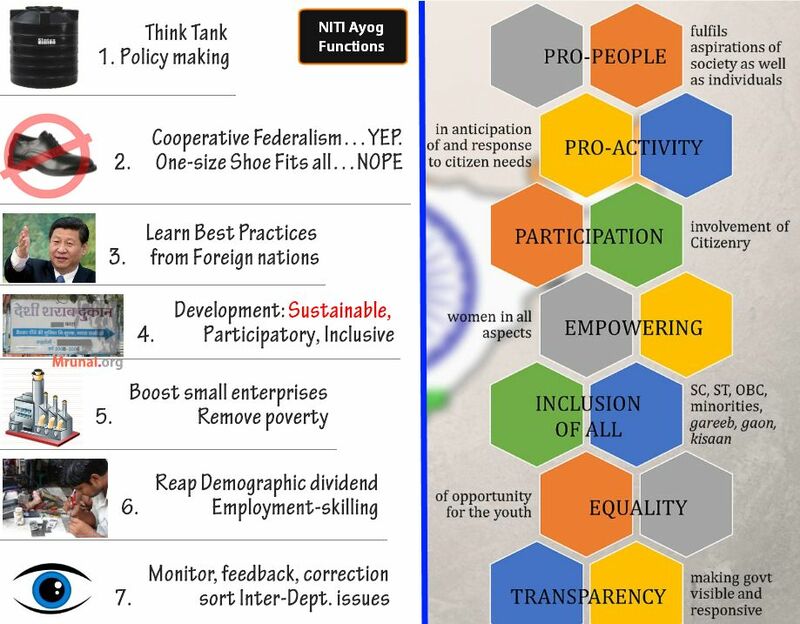 What is the full form of Niti Aayog? National Institute to Transform India. National Institute for Transforming India. National Institution to Transform India. National Institution for Transforming India. Q8. Niti Aayog is formed via ____. Allocation of business rules by President of India. Q11. 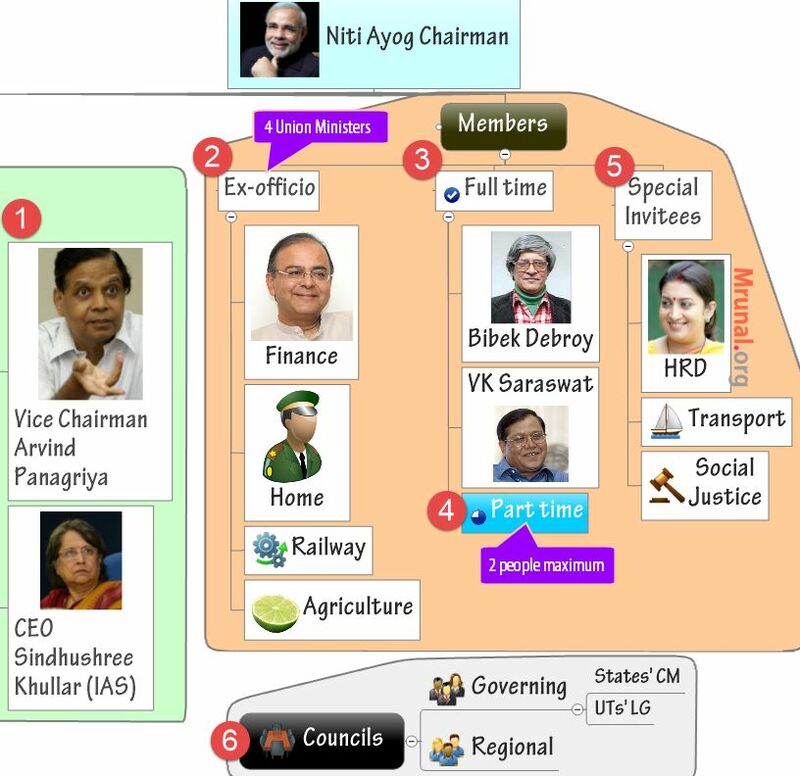 Who can become a part time member of the Niti Aayog? Q13. Official mandate of the Niti Aayog includes ___. Approving funds for state plans. If Modi wants to expand the powers of finance commission, he must amend article 335. If Modi wants to implement GST, he must amend article 315. Examine the inadequacies of machinery for planning to ensure democratic but depoliticized planning process in Indian federation since independence. Discuss how Niti Aayog aims to fix this anomaly. The planning process India in the post-Nehru period has conducted to better Centre-State relations, but (it has) not necessarily brought about decentralization of the planning process. Can Niti Aayog fill this lacuna? If not, suggest remedial steps. Inter-state council and not the Niti Aayog, is the appropriate instrument to ensure linkages between the district, the State and the regional levels of national planning processes. Do you agree? The ultimate picture of the development in India has to be a network of planning units in the villages and enterprises, coordinated at successive higher levels by State , which will ultimately feed the Niti Aayog at New Delhi.‘ Make out a case for decentralized and depoliticized federal planning in India. “A National planning body must have a statutory or Constitutional backing.“ Examine the argument in favor and against such design. Compare and contrast the structure and mandate of planning commission and Niti Aayog. (Interview) Without financial and Administrative powers, Niti Aayog may end up becoming yet another armchair advisory body like NAC. Do you agree? what will happen to national development council after NITI?. will it function or not? i found some mistakes in your article .. Thanks for your Noble cause. Really your post’s are very helpful. Just want one correction. I think for 12th Plan MMR target is 100..so please change it to 100 beside of 1000. Is this much info on 5 yr plans enough ? is this much info on the timeline of planning and the 5 year plans enough to know ? i want to discuss with you for atal innovation mission,atal tinkering lab,i have already develop labs in the schools and work in different innovative work for students can you appointed indicative vendor for development like srijan but i think is not suitable for developing lab. Compared to China, Communist party is a permanent body so 15 year plan can be thought of unlike in a democracy. Recently a news item has appeared in Uttar BangaSambad[ a daily newspaper in Bengali published from Siliguri] that Dr. Siddhartha Sarkar of Jalpaiguri has become a CORE COMMITTEE MEMBER of Niti Ayog. It was also stated that he is the only person in West Bengal to become a core committee member. Kindly confirm if the news is correct or not. Kindly inform also the criteria for becomming such a member since so far as I know his academic profile is not so high to be considered for a core committee member ofniti ayog. Thanks for assessing an eminent globally recognized person like him. You may visit his webpage to know his global contribution visiting at http://www.drsarkar.blogspot.in to ask reply yourself ‘who is he’. This membership is directly nominated by the Government of India and it is not open for all general people like you. please provide the solution also.